MoonMarble.com - *Sara Sally LaGrand - "Panda Head Marble"
Art Glass → Contemporary Handmade Marbles → *Sara Sally LaGrand - "Panda Head Marble"
*Sara Sally LaGrand - "Panda Head Marble"
Handmade marble by Sara Sally LaGrand. Sara is a glassworking demonstrator at the Moon Marble Company. 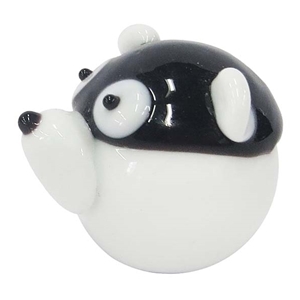 This quaint little black and white marble resembles the head of a cute cartoon panda. It is a sculptural relief of the face and ears, which means it sticks out on top of the marble and is not meant to roll. The marble diameter is approximately 1".